2.Whisk the egg whites, in a glass bowl, until foamy using an electric mixer. Add in the sugar a little at a time at medium speed and at the end add the vanilla. 3.When the mixture become stiff and shiny stop mixing and add the powdered sugar by folding gently into the mixture. 4.Divide the meringue into several bowls for the colouring, I used 4 bowls for the colours: White, purple, light pink and darker pink. Add the food colouring and only a few drops of the raspberry drops. Fold gently by hand until combined and smooth..
5.Transfer the meringue to pastry bags and use the tip you like. 6.Use a pen on a baking sheet to draw a heart at the size you wish. Turn the baking paper and pipe the meringue out in a shape of the heart and add sprinkle if you like. 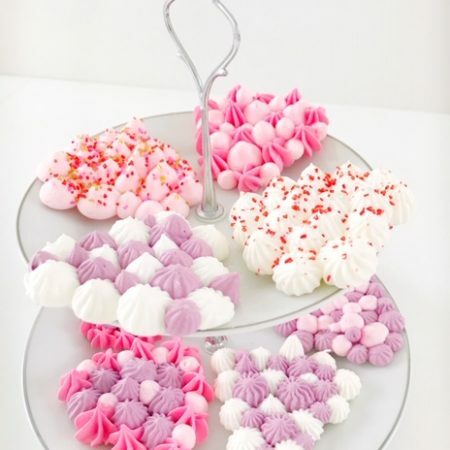 7.Place the meringues on a baking tray in the oven and bake for around 1 – ½ hours, or until the meringues are dry.